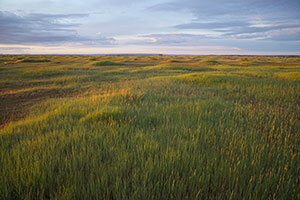 Library image #1: Rolling prarie. The United States Congress designated the UL Bend Wilderness (map) in 1976 and it now has a total of 20,819 acres. All of this wilderness is located in Montana and is managed by the Fish and Wildlife Service. Approximately 125 miles up the Fort Peck Reservoir and the Missouri River from the Fort Peck Dam, you'll find the UL Bend Wilderness. Situated within the Charles M. Russell National Wildlife Refuge, this area is characterized by breaks (badlands), steep-sided forested coulees, prairie grasslands, cottonwood river bottoms, and an abundance of wildlife: elk, mule deer, white-tailed deer, pronghorn antelope, bighorn sheep, coyotes, badgers, bobcats, Canada geese, grouse, and a wide variety of raptors. Prairie dogs have established "towns" here, complex systems of interconnected burrows that cover thousands of acres. Tyrannosaurus rex once hunted these grounds, and in many areas of the Wilderness little has changed since those forgotten days. Some of the remotest regions of the refuge are seldom seen and virtually unexplored by humans. Foremost among those regions is UL Bend Wilderness, which is a part of the UL Bend National Wildlife Refuge that is in turn swallowed by the vast Charles M. Russell National Wildlife Refuge (CMRNWR). You'll find UL Bend north of a tight U-shaped bend in the Missouri River in the western section of the CMRNWR. The Wilderness is divided into four units: three small northern units and the large southern unit that borders the river. The area is almost entirely open grassland and sagebrush, without water and exposed to the whimsy of prairie winds. There are no maintained trails, but hiking and camping within the Wilderness are unrestricted, scenic, and rugged. Horses, hunting, and fishing (in season) are allowed. Many paddlers on the Missouri continue down past the Wilderness on placid waters. High winds may make open areas of water dangerous. You'll be paddling in the long-gone wake of Lewis and Clark. Planning to Visit the UL Bend Wilderness? How to follow the seven standard Leave No Trace principles differs in different parts of the country (desert vs. Rocky Mountains). Click on any of the principles listed below to learn more about how they apply in the UL Bend Wilderness.